It is important for a pilot to know the direction of the wind. At facilities with an operating control tower, this information is provided by ATC. Information may also be provided by FSS personnel either located at a particular airport or remotely available through a remote communication outlet (RCO), or by requesting information on a CTAF at airports that have the capacity to receive and broadcast on this frequency. When none of these services is available, it is possible to determine wind direction and runway in use by visual wind indicators. A pilot should check these wind indicators even when information is provided on the CTAF at a given airport because there is no assurance that the information provided is accurate. The wind sock is a good source of information since it not only indicates wind direction but allows the pilot to estimate the wind velocity and/or gust factor. The wind sock extends out straighter in strong winds and tends to move back and forth when the wind is gusting. Wind tees and tetrahedrons can swing freely and align themselves with the wind direction. 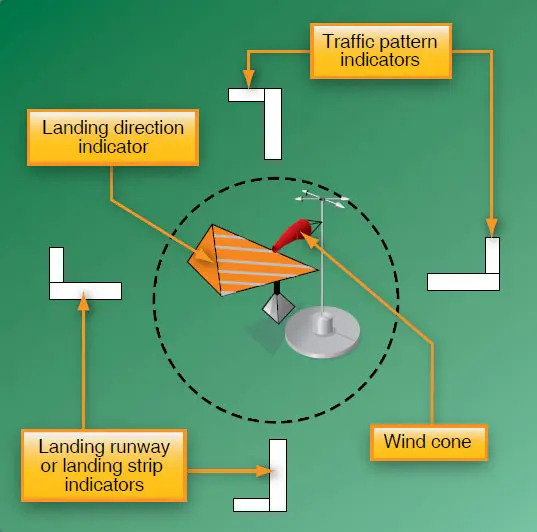 Since a wind tee or tetrahedron can also be manually set to align with the runway in use, a pilot should also look at the wind sock for wind information, if one is available.